"What Calvinism accomplished was to fulfill the psychic needs of both upwardly mobile middle class entrepreneurs and alienated workers. Middle class businessmen (and they were men) could ascribe their economic success to their spiritual superiority." This is one of the points Jason Miller makes in his perplexing treatise entitled "Calvinism, Capitalism, Conversion, and Incarceration." Ellis Murphree compares what he calls "Convinced Calvisnism" and "Reactionary Calvinism," and is "somewhat suspicious of the Calvinism that has become so 'faddish' amongst the younger ranks in Fundamentalism today." I think he's right. Many Calvinists seem to treat this precious doctrine merely as an intellectual exercise, using it to belittle others in an attempt to stroke their own fragile egos. May we heed the words of the Apostle Paul: "But far be it from me to boast except in the cross of our Lord Jesus Christ, by which the world has been crucified to me, and I to the world" (Galatians 6:14). 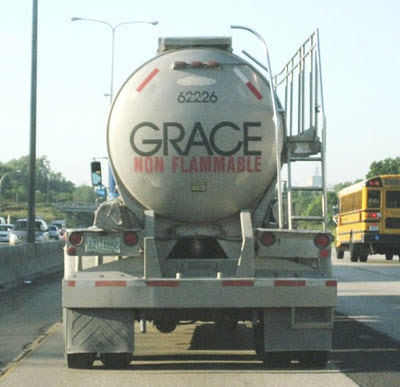 One Arminian admits, "The doctrine of prevenient grace is now a bit confusing to me. Am I understanding correctly that the grace which precedes faith and regeneration is an 'awakening' grace? If so, then I cannot remain an Arminian. To 'awaken' a dead spirit is to regenerate a dead spirit; and if a spirit needs regenerating before he can believe on Christ, then the Calvinists are correct." What can the church learn from Calvin and Hobbes? Plenty. If there's anything more annoying than an ungracious Calvinist, it's a disgruntled ex-Calvinist who spews lies like this: "Predestination theory was around before John Calvin because some people wanted to attribute an interpreted sense to Paul's letters. Being barbarians of the day, they decided that God was really evil instead of good, and that God must condemn some people for no reason at all." Oh, in case you haven't figured it out yet, Calvinism is a "blasphemous heresy." Just thought you'd like to know. The Seeking Disciple says, "Arminians should be willing to come to the Bible and be willing to examine all of it, from Genesis to Revelation, even where it seems to contradict what we believe." There's just one problem: the more one studies the bible, the more one is at risk of becoming a Calvinist! This video provides a brief summation of Calvinist beliefs. Your second point is seems to be quite true.